Thirty years ago, Neil Gordon founded InSync Solar to provide the window covering industry with engineered shading devices and services. 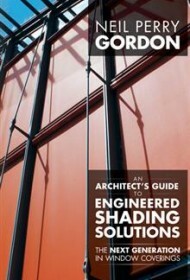 An Architect’s Guide to Engineered Shading Solutions provides the history and evolution of mechanical sun shading for architects and engineers and details options that are currently available. The author defines “Engineered shading solutions” as “sustainable systems for interior and exterior window coverings, which engage the latest technologies to control heat, glare, and light.” Such systems can save energy and reduce operation costs. For example, when air needs heating, mechanical shades can be designed to open more glass area to the sun. At night, shading devices can close to reduce heat loss. The book gives a thorough, and rather technical, review of various shading options, with chapter titles such as: “The Dynamic Façade,” “Skylight Shading Solutions,” “Dual Shading Solutions,” “Exterior Shading Solutions” and so on. Manual and motorized applications are covered, as are coupled roller shades for continuous windows and smart devices used to control shading, among other topics. The book does a credible job of giving readers an overview of such systems and devices, but is less complete in detailing the relationship of window shading with other building systems. The author repeatedly stresses that to effectively create sustainable buildings, structures must be designed so that all systems involved work in concert; he isn’t expansive, however, in discussing how to accomplish this or how these systems can complement one another — which would have provided a much broader use for the book. This book is generally well organized and includes a helpful Table of Contents and Glossary. Its narrow scope will limit its usefulness for architects, but those new to the topic may find it a helpful launching point for learning about shading solutions.